Abstract: Extensive research has been conducted in the Multi-Regional Clinical Trial (MRCT) area. To effectively apply an appropriate approach to a MRCT, we need to synthesize and understand the features of different approaches. 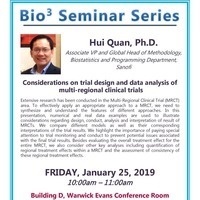 In this presentation, numerical and real data examples are used to illustrate considerations regarding design, conduct, analysis and interpretation of result of MRCTs. We compare different models as well as their corresponding interpretations of the trial results. We highlight the importance of paying special attention to trial monitoring and conduct to prevent potential issues associated with the final trial results. Besides evaluating the overall treatment effect for the entire MRCT, we also consider other key analyses including quantification of regional treatment effects within a MRCT and the assessment of consistency of these regional treatment effects.